Whether you are just starting out, or need a RESET, we know that nutrition can be a confusing topic. In our steps to success program, we want to guide you through what we think are the 5 Important Factors that lead to creating a "New Normal" when it comes to your nutritional habits! You have a goal to achieve. You want to make a change, but the real question is why? Trends come and go and motivation can fade, but if you have a deep purpose, a true reason why you want to change, the likelihood that you are going to stick with your plan and create a "new normal" is significantly higher. Starting with your "All In Plan" can help clarify your purpose and give you a sense of direction like never before. Once you have your purpose, then you can start filling in the behaviors that will increase the opportunity for success. Setting behavioral goals will help create the habits necessary to succeed. Rather than setting goals like, "I want to lose 20 lbs," instead, build goals around the behaviors that will help you achieve that goal. Statements like, "I will eat breakfast everyday." "I will prepare my meals for lunch this week so I don't eat out." These specific behaviors will lead to a pattern, that will not only help you achieve success in the short term, but allow you to sustain your plan for a lasting change. Do you think eating healthy is boring? Do you get tired of eating the same old lame meals? 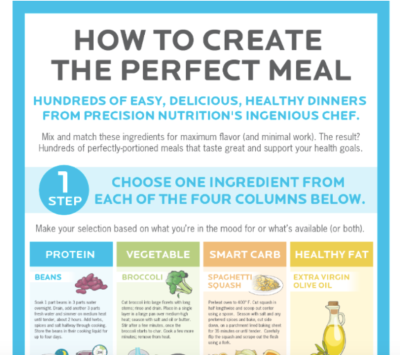 This infographic from Precision Nutrition will help you create the perfect meal, no matter what. It is designed to help you create great meals from a variety of choices, by simply knowing what to substitute and how to pair great foods together. So, now you know how to create the perfect meal. Let's take some time to map out your day! Looking at these sample menus can help you see what a great day looks like nutritionally. Find the meals you love, plan them out according to your day and even week! By preparing your food in advance and knowing what your menu will look like, you will be able to resist the urge to eat meals you don't want because you are not prepared. A great practice to go along with planning your menu is selecting some time each week to prep some food. Begin by choosing meals you love, prepping your protein, baggin your veggies and fruit and know when and where you are going to eat ALL of your meals in advance. 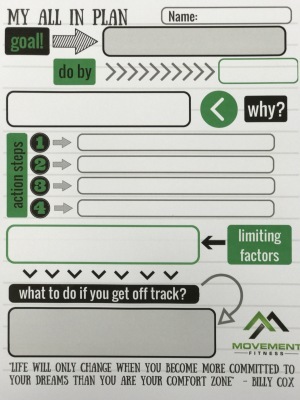 This Cheat Sheet is designed to easily help you evaluate your meals and help you get on track with your goals. Look at your meals. What are you currently doing that doesn't align with these 5 items. This guide will quickly help you identify the things that don't align with your nutritional goals. At some point during this transformation you will hit a plateau. It happens to everyone during his or her journey. Sometimes this plateau is just your body adapting to the new style of eating and living and things will pick up after a week or two once the body gets adjusted. 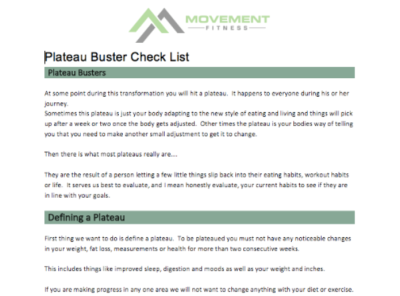 Other times the plateau is your bodies way of telling you that you need to make another small adjustment to get it to change. Then there is what most plateaus really are…. They are the result of a person letting a few little things slip back into their eating habits, workout habits or life. It serves us best to evaluate, and I mean honestly evaluate, your current habits to see if they are in line with your goals. This guide will help you evaluate what changes you really need to make (or not make) in order to continue to see progress!